Together. Helping organizations drive digital transformation in a hybrid world. Data is the key to success. Where it lives is not as important as how well you integrate and deliver it to any user, in any application, at any time. Microsoft delivers a flexible, scalable infrastructure, an advanced analytics platform, and leading business applications that straddle on-premises and cloud. 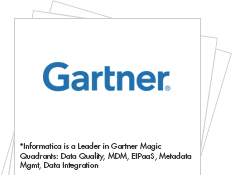 Informatica provides hybrid data management solutions designed to optimize workloads for analytics and other data-intensive initiatives by rapidly integrating and managing data from any cloud or on-premise sources into Microsoft Azure, Cortana Intelligence Suite, or Microsoft Business Applications. Transform data into actionable insights with enterprise-class data management for Azure and Cortana Intelligence Suite. Drive exceptional experiences with purpose-built connectivity to Microsoft Dynamics, SharePoint, and Office applications. to improve their health and fitness.